Northeastern Iran holds the highest denstiy of Persian leopard in the worlds with some well-conserved habitats for the less-known creatures in Iran. 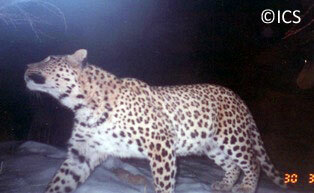 The present survey targeted the leopard as one of the most endangered felids in Iran through a field-based scientific framework to obtain information about the leopard population parameters, habitat selection, diet, ranging and dispersal, prey and competition interactions, people’s attitude and conservation needs. A main part of the project was based on camera trapping beside continous tracking to verify the data. In addition to the final scientific base and conse rvation strategies, a young conservationist team learnd more together and their experience will be published as a book. Moreover, a special attention was paid toward local communtieis around the national parks in order to be educated. This project was of the first mid-term surveys on the Persian leopard in Iran which has played a leading role for more investigations on the species in other west Asian habiats. In coming phase, imprtant corridors of the leopards have been recognized in order to launch a radio-telemetry effort on the animals to monitor their movements.